English: An adult and sub-adult Minke whale are dragged aboard the Nisshin Maru, a Japanese whaling vessel that is the world's only factory whaling ship. The wound that is visible on the calf's side was reportedly caused by an explosive-packed harpoon. 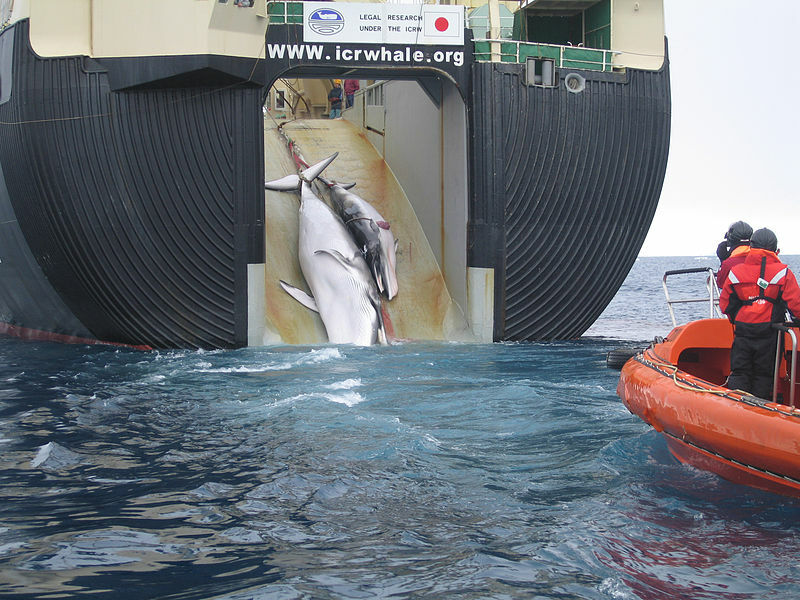 This image was taken by Australian customs agents in 2008, under a surveillance effort to collect evidence of indiscriminate harvesting, which is contrary to Japan's claim that they are collecting the whales for the purpose of scientific research. In 2010, Australia filed a lawsuit in the International Court of Justice hoping to halt Japanese whaling; this photograph will undoubtedly play a key role in that pending case. "The Commonwealth Copyright Administration (CCA) within the Attorney-General’s Department has been disbanded and no longer provides copyright licences allowing members of the public to re-use Commonwealth Government copyright material. In line with a recommendation of the Government 2.0 Taskforce Report, Commonwealth Government agencies are now required to release copyright public sector information under Creative Commons BY-licences or other open content licences, wherever possible." "These images are provided for external use but please credit Australian Customs and Border Protection Service. Regards." Ce fichier est disponible selon les termes de la licence Creative Commons Paternité – Partage des conditions initiales à l’identique 3.0 Australie. Ce document provient de « https://fr.wikipedia.org/wiki/Fichier:Japan_Factory_Ship_Nisshin_Maru_Whaling_Mother_and_Calf.jpg ».